Donald Trump has managed to survive one year as the alleged President of the United States. It’s actually quite an accomplishment considering that he has produced almost nothing but decline, catastrophe, hatred, and embarrassment. Any other political figure would have crumbled under the weight of such failure, but that’s only because other leaders have had at least some measure of dignity and/or shame. On this solemn anniversary Trump is mired in a government shutdown of his own making. It was through intentional neglect of duty and purposeful self-interest that Trump has found himself in this dilemma. Simultaneously, he’s staring down special counsel Robert Mueller’s investigation into his collusion with Russia, financial corruption, and obstruction of justice. And he repeatedly displays a sort of racist Tourette’s Syndrome, blurting out bigoted slurs and insults uncontrollably. The video covers a lot of territory. But most of it is in Trumpian Fantasyland. It boasts about Trump’s recent tax reforms that mainly benefit corporations and the rich. It includes a sound bite from Trump saying that his plan was “the biggest tax cut and tax reform in the history of our country.” It wasn’t. Even President Obama had larger cuts, twice. The video also praises the Trump administration’s assault on regulations that protect the American people from predatory financial institutions, dangerous workplaces, and toxic water, air, and food. Somehow these attacks on average Americans are viewed as positive by Fox News. The network also regards the “chip[ping] away at ObamaCare” as another Trump “success.” And the same goes for Trump’s record on judicial appointments. The video brags that “When Trump took office he inherited more than 100 federal judicial vacancies.” However, that was due to the unprecedented obstruction of Mitch McConnell in the GOP controlled Senate, who denied Obama his Constitutional right to nominate justices and judges. Even so, Trump only had twenty-three judicial confirmations. Finally, the Fox News love-fest credited Trump with defeating ISIS. Never mind that he did absolutely nothing to alter the military operations that were put in place by the Pentagon during Obama’s administration. ISIS had been losing ground for months prior to Trump’s inauguration. And the Iraqi army was mainly responsible for recapturing territory from the terrorists, with training and air support from the U.S.
Like any well crafted commercial, this video ended by repeating Trump’s branding, “Make America great again.” Tacking that slogan onto the end was exactly what any marketing executive would have done if the video were for Diet Coke or Toyota. There is only one way to describe this video: Pure propaganda. When a media enterprise produces such cringeworthy flattery on behalf of a political figure they are supposedly covering, it can’t be taken seriously as journalism. It’s proof that the network is a totally owned and operated subsidiary of the White House that shamelessly panders to our Narcissist-in-Chief. 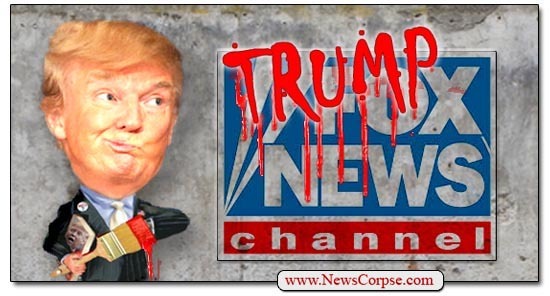 And in the process Fox News is deliberately misinforming the public and advancing the ignorance and division that is the hallmark of the Era of Trump.